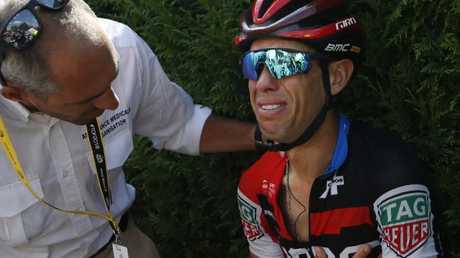 RICHIE Porte has suffered the cruellest case of deja vu, crashing out of the Tour de France for the second consecutive year. 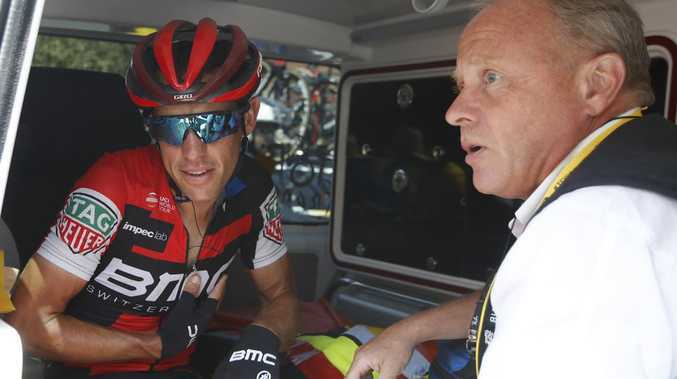 Porte's Tour campaign ended in a French hospital with a broken collarbone instead of the Champs Elysees podium after a big pile-up only 10km into Stage 9. It is the same stage that he spectacularly fell on 12 months ago, fracturing his pelvis. 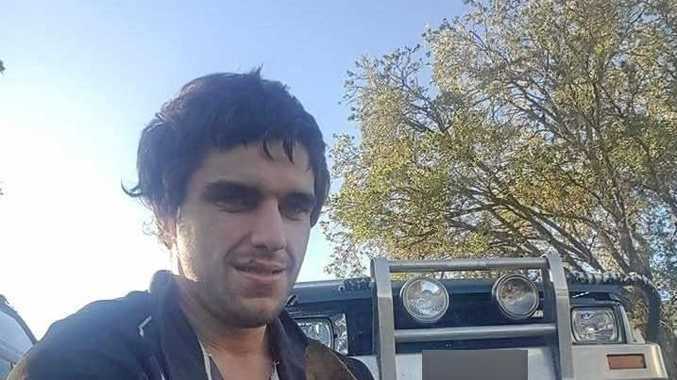 The Australian broke down in tears on the roadside as the realisation hit home that his Tour dreams had again been shattered in horribly unlucky circumstances. "For the second year in a row I am ending the Tour de France like this. I was on the ground before I knew it and straight away felt pain in my right shoulder," Porte said. "I want to say a big thank you to my teammates for their incredible work over the first nine days. "We had a great first week and I'm so disappointed that I won't be continuing to Paris. I hope to recover as fast as possible and get back to racing." 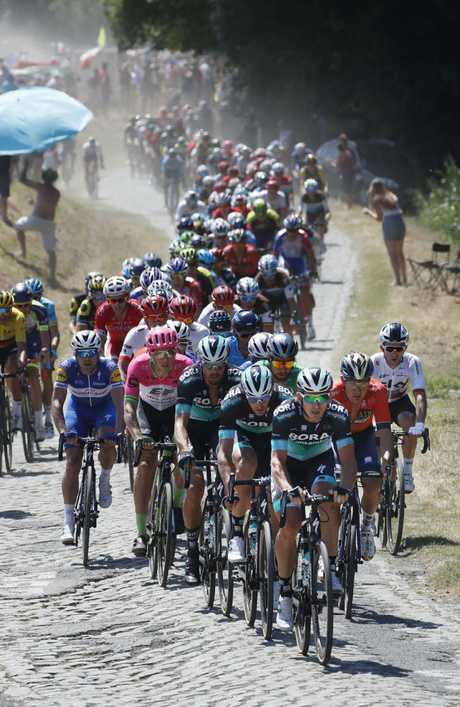 Porte was one day away from navigating his way through a well-documented difficult first half of the race, which will move to the Alps and his preferred playground next week. "I feel so sorry for him. I know what it means to crash out of a race you really prepare for," Porte's teammate Stefan Kung said. "I wish him all the best. We would have loved to have looked after him for a little longer. "We were ready and he was ready. We had a big build up to this Tour de France and the plan was just to get through today and then hit it in the mountains. "It's just not meant to be that Richie makes the podium in Paris in BMC colours." It's unclear what caused the crash just outside the start town of Arras, with several other riders also hitting the bitumen and a spectator down hurt. "We crossed the road and there was a little hole," Kung said. "I don't know exactly what happened, maybe someone dropped a bottle or slipped off the handlebars. I was on the left and there was a mass pile up." Several of Porte's teammates, including Simon Gerrans, stayed by his side for several minutes, seemingly unwilling to accept the diagnosis. "We waited for almost five minutes. Then they took him to the hospital," BMC sports director Fabio Baldato said. "It's really disappointing and frustrating afer all the hard work we've done to now." Cadel Evans, the only Australian to win the Tour de France and a former BMC rider, tweeted: "Can't believe it." Porte's wife Gemma, watching from home with the couple's newborn son, wrote "I hate cycling." 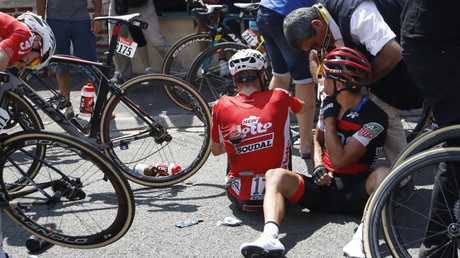 It is a heartbreaking setback for Porte, who has suffered all kinds of bad luck in Grand Tours. He had recovered from last year's devastating fall and had set himself for the Tour de France podium. Many thought he could win this year's Tour. 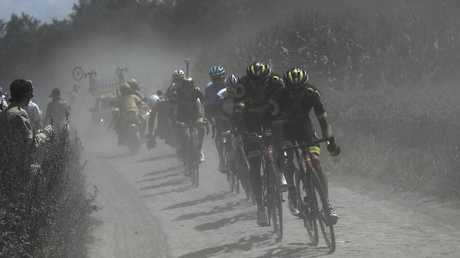 But this stage, with 21.km of cobbles spread across 15 sectors, hung over him and the title contenders. Porte last month told the Herald Sun it was his "biggest cloud" coming into the race. Speaking before the start of Sunday's stage, he admitted the pressure was building. "It's one of the crucial stages. Today will tell a lot. Hopefully I get through unscathed," he said outside the team bus. "Some guys are going to have better days than others. It's been so stressful. I think today you can really feel it, it's going to be one of the more stressful days but let's see how it all pans out. "I remember in 2014 it was pouring rain here and I got through OK so hopefully I can do it again." But for the second time in as many years, Australia's leading contender will again be watching the rest of the Tour from his couch. Porte's disaster means the three main Australian drawcards for the Tour this year either have not started or are out of the race. Australian team Mitchelton-Scott controversially did not pick young sprint ace Caleb Ewan. Instead, Mitchelton-Scott have put all their resources behind British overall hope Adam Yates. Australian star Michael Matthews, the reigning green jersey champion, also abandoned before stage five because of illness. John Degenkolb won a three-man sprint to take victory in the chaotic stage.